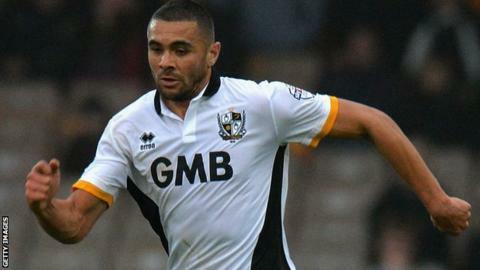 Colin Daniel inspired Port Vale as they fought back from a goal down to beat Fleetwood at Highbury. Bobby Grant had put the hosts in front on 14 minutes when he beat two men inside the box before hammering a low shot into the far corner. However, Vale changed things at half-time and substitute Daniel levelled with a long-range drive on 56 minutes. Nine minutes later, Daniel was then tripped in the box by Victor Nirennold and Sam Foley converted the penalty. "I chose my words very carefully at half time and made it quite clear that it was a million miles off what we are all about. "The first-half performance wasn't acceptable. Thankfully we had a reaction. It showed our character to come from a goal behind and win. "I felt we had to change it at half time if we were to get anything. Colin Daniel was outstanding in the second half and the first person who went to congratulate him on his performance was Uche Ikpeazu. That says a lot. It is about the squad performance, not just the 11 that are out there." Match ends, Fleetwood Town 1, Port Vale 2. Second Half ends, Fleetwood Town 1, Port Vale 2. Attempt saved. Jimmy Ryan (Fleetwood Town) left footed shot from outside the box is saved in the bottom left corner. Substitution, Port Vale. Chris Birchall replaces A-Jay Leitch-Smith. Attempt saved. Antoni Sarcevic (Fleetwood Town) right footed shot from outside the box is saved in the bottom right corner. Attempt missed. Jimmy Ryan (Fleetwood Town) right footed shot from outside the box is close, but misses to the right. Foul by Declan McManus (Fleetwood Town). Anthony Grant (Port Vale) wins a free kick in the attacking half. Antoni Sarcevic (Fleetwood Town) wins a free kick in the attacking half. Foul by Colin Daniel (Port Vale). Foul by Conor McLaughlin (Fleetwood Town). Conor McLaughlin (Fleetwood Town) wins a free kick in the attacking half. Substitution, Fleetwood Town. Stephen Jordan replaces Tyler Hornby-Forbes because of an injury. Corner, Port Vale. Conceded by Victor Nirennold. Attempt missed. Louis Dodds (Port Vale) right footed shot from outside the box misses to the left. Corner, Port Vale. Conceded by Declan McManus. Corner, Port Vale. Conceded by Tyler Hornby-Forbes. Attempt missed. Byron Moore (Port Vale) right footed shot from the left side of the box is too high. Attempt missed. Jamie Proctor (Fleetwood Town) right footed shot from outside the box is high and wide to the left. Declan McManus (Fleetwood Town) is shown the yellow card for a bad foul. Richard Duffy (Port Vale) wins a free kick in the defensive half. Bobby Grant (Fleetwood Town) is shown the yellow card for a bad foul. Foul by Bobby Grant (Fleetwood Town). Attempt saved. Declan McManus (Fleetwood Town) right footed shot from the left side of the box is saved in the centre of the goal. Attempt saved. Bobby Grant (Fleetwood Town) left footed shot from outside the box is saved in the bottom right corner. Remie Streete (Port Vale) is shown the yellow card for a bad foul. Antoni Sarcevic (Fleetwood Town) wins a free kick in the defensive half. Foul by Remie Streete (Port Vale). Substitution, Fleetwood Town. Declan McManus replaces David Ball. Substitution, Fleetwood Town. Jamie Proctor replaces Jamille Matt. Goal! Fleetwood Town 1, Port Vale 2. Sam Foley (Port Vale) converts the penalty with a right footed shot to the centre of the goal. Penalty Port Vale. Anthony Grant draws a foul in the penalty area.